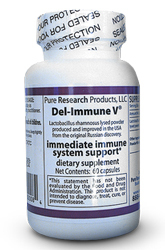 Del-Immune V®, by Pure Research Products, contains a specific lactobacillus discovered in the 1970's in Russia. This product contains pure cell wall pieces and has shown to have significant immune supporting properties. Now made in the United States under controlled conditions that have greatly increased product potency. Ingredients: (per serving) Lactobacillus rhamnosus lysed powder - 100 mg.
Other ingredients: Purified cellulose powder NF and vegetable capsule. Suggested Use: 1 or more capsules a day or as directed by a health care practitioner.